My friends asked me if I could supply the cake for their joint birthday celebration last weekend. I heart cake making and would love love love to make cakes for everyone in the world if the world would just let me, so I was thrilled at the chance. They supplied me a picture of a fondant ruffle cake which was way out of my realm of expertise. 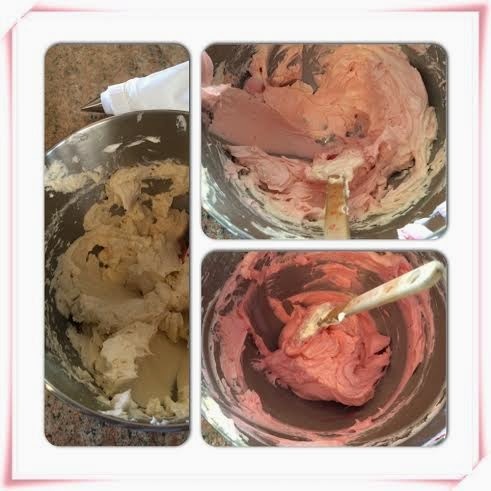 Since I hate the taste of fondant, I decided that I would try and create a buttercream version of the same idea. I got a very, very different result, but I was happy with it. I also was able to figure out why it turned out so differently, so I'll chalk it up to learning and do better next time :) I had too much air in my icing and piping bag, which created a "jagged" ruffle, but I actually really liked the effect! For the cake, I have to admit I cheated. I usually make chocolate cake from scratch, but that perfect scratch white cake is still eluding me (I'll post my attempts as I continue to make them). So I used good old Betty Crocker white mix. 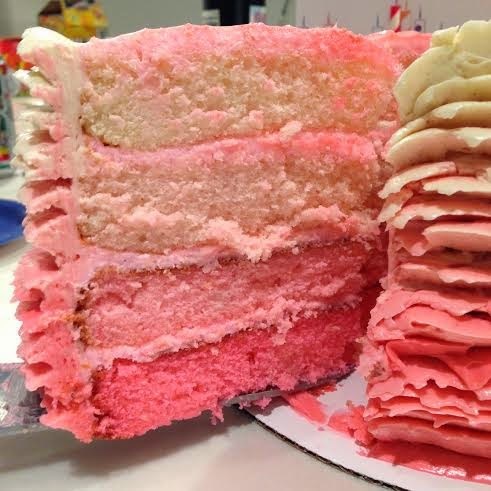 I figured since I as upping my game by doing an ombre effect, and using swiss meringue buttercream over regular old powdered sugar buttercream, that I could skimp on this step. I'll try harder next time! I really, really need one of those cake levellers. Maybe Santa will bring one. A serrated knife and my eyeballs just won't cut it in the long run. I filled and crumb coated the cake with a regular old buttercream (1/2 cup vegetable shortening, 1/2 cup butter, 4 cups icing sugar, 2 tbsp milk, 1 tsp vanilla). 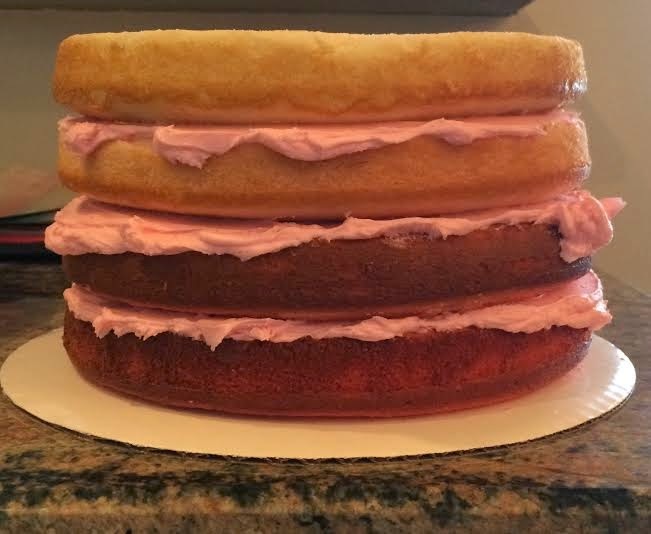 The decorating process started with finally trying out Swiss Meringue Buttercream (SMB). 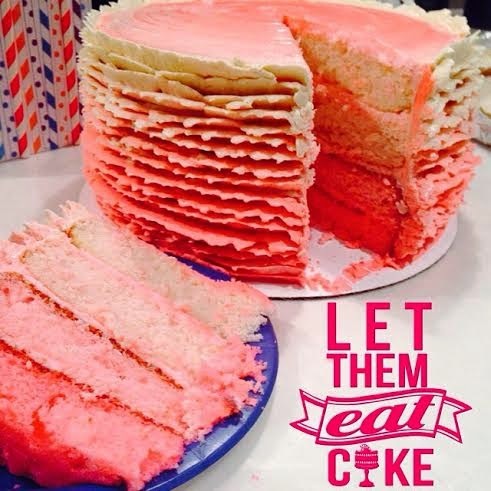 I've read so much about how it is less sickeningly sweet than regular North American style buttercream. Apparently it's silkier, easy to pipe, and just the perfect level of sweetness. Good 'ol Martha helped out here. I used the SMB recipe from her website. I followed it exactly without any modifications and got an absolutely delicious, silky result. My daughter loved watching the heated egg whites and sugar whip up. One note on SMB: always, always, always, always, always flavor it! Whether it's just plain old vanilla extract or the addition of fruit puree, I have read so much about flavoring SMB. If you don't, you're essentially eating slightly sweetened butter. It's not that awesome plain. Once you flavor it, WOW! This recipe basically tasted like sweetened whipped cream. But it was stable, and held shape. I can't wait to try flavoring with fruit puree. Pinterest is abound with flavoring ideas for it. Anyways, I made the SMB, and then colored it with food coloring paste similar to the cakes. 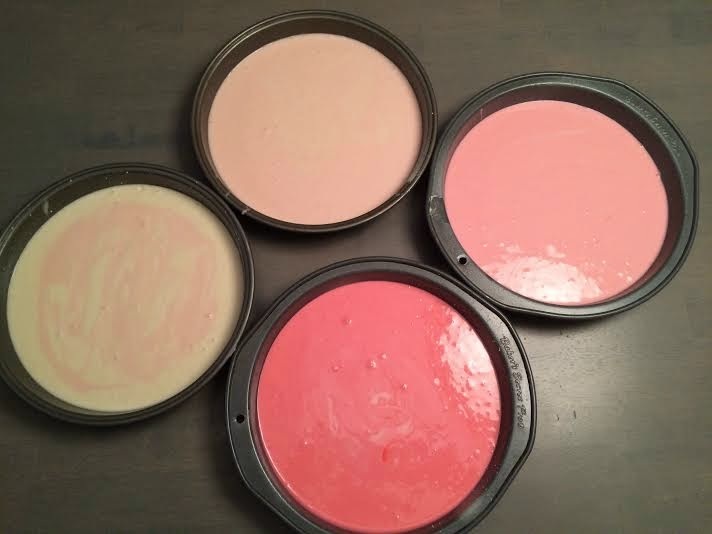 I filled a piping bag with white on the bottom, followed by progressively darker shades of pink. I used the Wilton 125 tip. Starting at the top of the cake, holding the fat end of the tip downwards, I quickly piped ruffles along the outside. 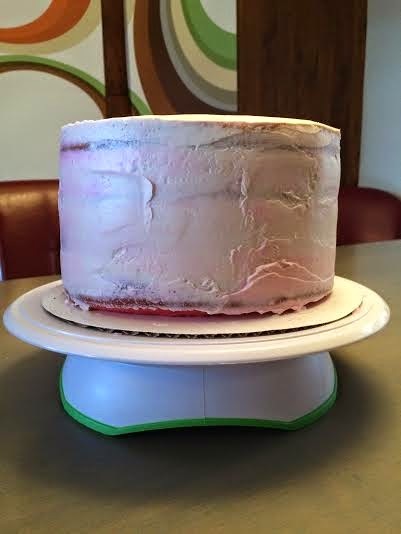 I have a cake turntable, so basically turned that while leaving my hand in one position and piping. As I mentioned above, I got a very cracked edge on my ruffles, which was not my intention, but in the end I liked the jagged effect. This was due to having too much air in my piping bag while filling the layers of colored SMB. I have to be more careful filling next time, or use a smaller tip (a smaller version is the Wilton 104), which is far more forgiving to the air bubbles and much smoother (I found this out after troubleshooting what went wrong later). I'm such a baking nerd. I asked my friends to take a picture of it when they cut it later that evening (I had a Christmas party and couldn't attend the celebration). Here was what they sent! 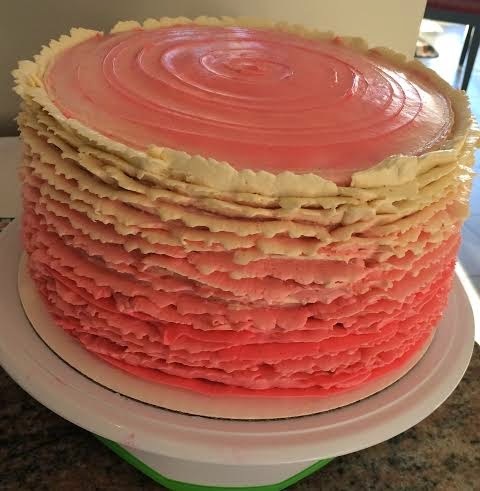 Although the cake didn't look as I intended, I was pleased at my first attempt at SMB, ruffles, ombre, and 4 layers! I can't wait to play around and make some Christmas themed cakes!